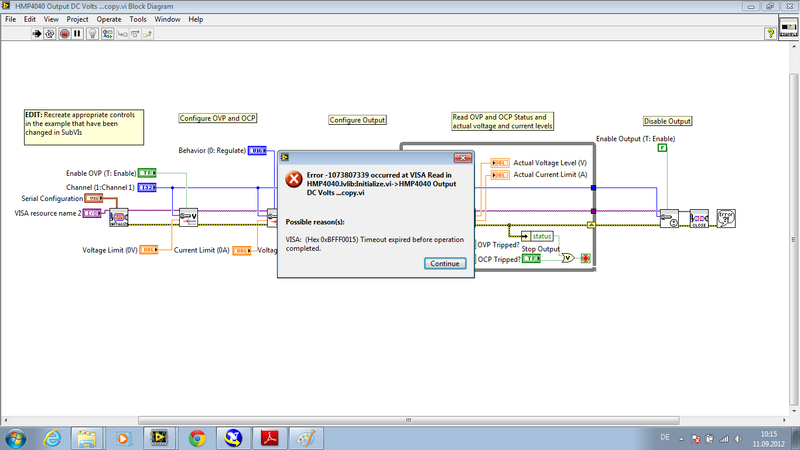 Re: Why do I Receive Timeout Error -1073807339 on VISA Read or Write? Error -1073807339 occurred. Timeout expired before operation completed. What causes this error, and how do I fix it? 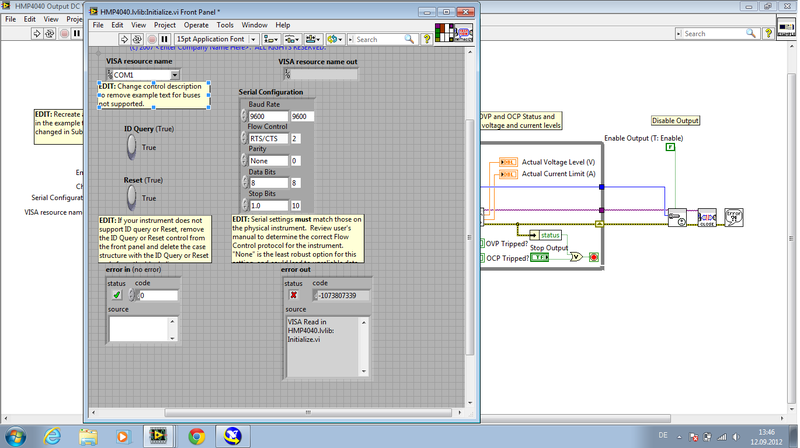 I am communicate my device by using RS232 cable. and also here I am sending you attachment regarding to error page . * inappropriate serial settings: Check if you configured the driver to what the device is expecting (usually 8N1 with 9600 Baud (8 Data bits, No parity, 1 Stop bit). Check the device's manual! * inappropriate serial cable: Check the device's manual! 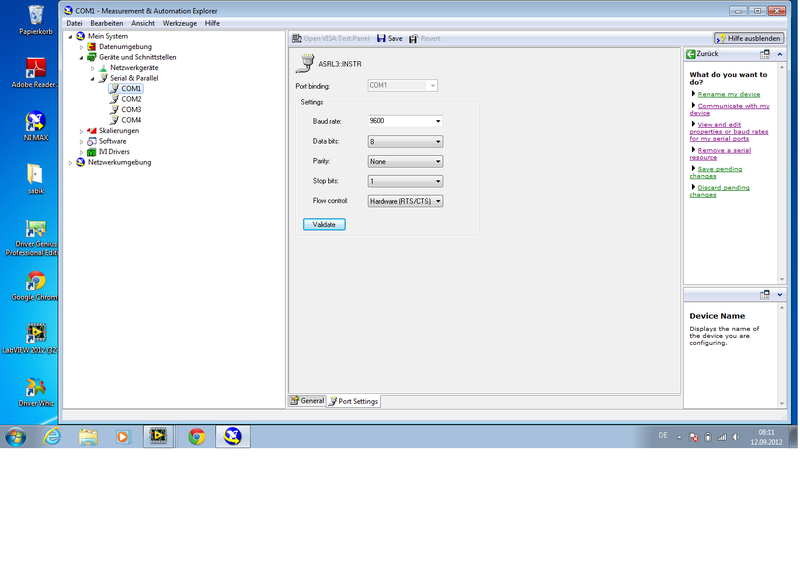 It might be helpfull to use MAX to test the VISA serial connection first; you got more possibilities to asure a working connection with the device. I have checked all the setting and read the manual as you said,but still I am facing same problem . 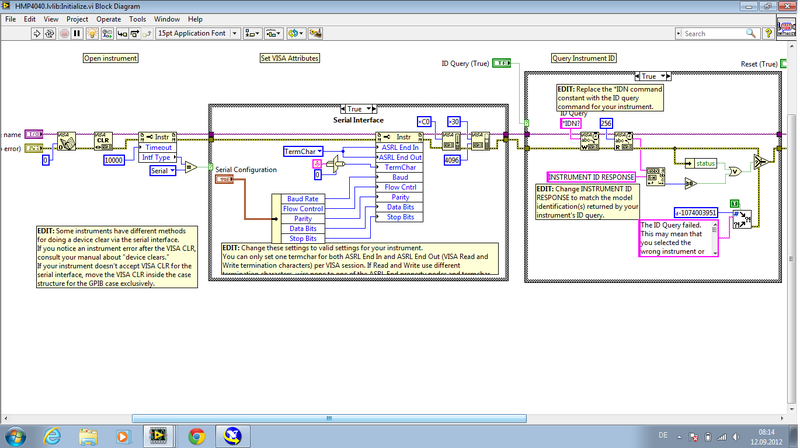 I tried to check my initialization block diagram but in the Instrument Query Id I got the error here I am sending you that diagram and also my Ni max setting figure. and One more thing that I am not able to open my visa test panel. thank you again for reply. any how I got success to run my visa control panel but still I am facing same problem during when i tried to run my initialize.vi in read visa. I am really need your help as i stuck here in this problem from last 3 days. 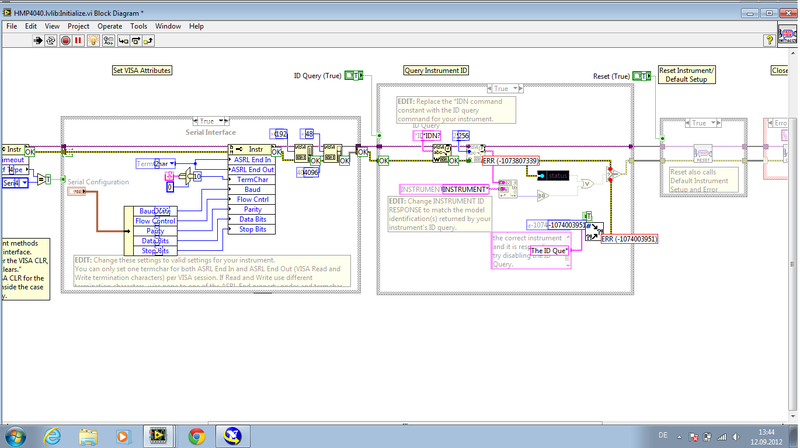 will you please guide me here i am sending you my labview example with some error snaps. You know, your code returns an error when reading the first time from your instrument. As you never got any response it is hard to tell what causes your problem. Still the same possibel reasons as I stated above. What I'd suggest is to return to VISA control panel, configure your port and send a message to your device; best the proper 'IDN?' command (again, look in the manual, every manufacturer may have its own command set). Afterwards you try to read about 25 Bytes from the device and check if it is what you expect. If you get anything you know that you etsbalished the communication, but the command was wrong. If you get nothing you know your command was either incomplete (Missing 'CR' (=0x0D) or 'CRLF' (==x0D0A) ?, RTFM), bad at all and the device does not react on incomplete or bad commands, or your port configuration was wrong.